A day of celebration, a day of gathering, a day for friends. This is what our meetings are all about. Since most of us are not fond of meetings, there’s way too many in life, ours have become an opportunity to eat, drink and be merry. March 21st was a day of sunshine, banishing the wooly memories of winter. Our two ‘Wing Up’ scholarship winners, Nina Ortega and Nic Kinsman, were to be honored and to learn more about all they are involved in. Nic, who is originally from New York, is in a graduate degree program at University of California Santa Cruz, studying coastal behavior. With her flying abilities she is able to capture events (waves, dunes, marine terraces, beach, cliff erosion, fault activity and global influences) on our northern CA coast. She uses her personal, bird’s eye view to add to satellite imagery and bring a greater understanding of our symbiotic relation with our ocean neighbor. Nic shared a great slide show that she uses to teach with at UCSC. Very cool and interesting stuff. Never thought I’d learn so many different shapes of waves and beaches. Thanks to her for a great presentation. Nina is involved in the ongoing computer relationships of the Petaluma airport. What a job she has had bringing everyone into the computer age. It’s a somewhat thankless job that we really appreciate. Way to go both of you! 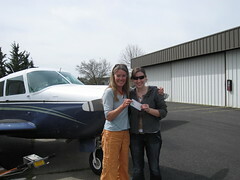 We are so proud of what you’ve brought to women in aviation. 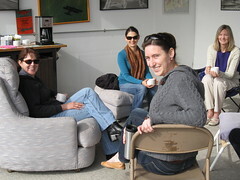 The big effort this year will be our ‘Women on Wing’ day at Petaluma Airport, June 19th. Barbara O’Grady will be leading the effort and will have more planning to share as the date gets closer. This will be a day we really need you to show up for a few hours and share your stories with any women interested in aviation. Get it on the calendar now. Our Southwest Section Meeting is right around the corner and across the bay. April 29 & 30 the western aviatrix will be gathering at the Concord Crowne Plaza for two days of networking, voting and learning from one another. I’m going to be leading a hike up Mt. Diablo on Sat. afternoon if anyone is interested in joining me. These are opportunities to get to know what our organization is all about and has to offer you. Come join us! Contact SWS99s for registration and details.